Montenegro has a Mediterranean climate on the coast, with alpine conditions in the mountains. The average summer coastal temperature is 27°C (81°F), and this is peak season (Jul-Aug), when the majority of visitors come here. Those who can’t bear the summer heat would do well to head inland for the mountains, where summer night time temperatures drop as low as 12°C (54°F). In shoulder season (May-Jun and Sep-Oct) you can expect sunny days on the shores of the Adriatic – the sea is warm enough to swim, but without the crowds, and average daytime temperatures are 20°C (69°F). This is the ideal time for outdoor activities such as hiking and cycling, though bear in mind that there will be sporadic rain in the mountains. In winter, medium weight clothing and heavy overcoat and boots if travelling in the mountains; in summer, lightweight clothing, swimwear and sun cream required on the coast, plus a jumper or jacket for colder nights in the mountains. Montenegro is bordered by Croatia to the north, Bosnia & Herzegovina to the northeast, Serbia to the east and Albania to the south. 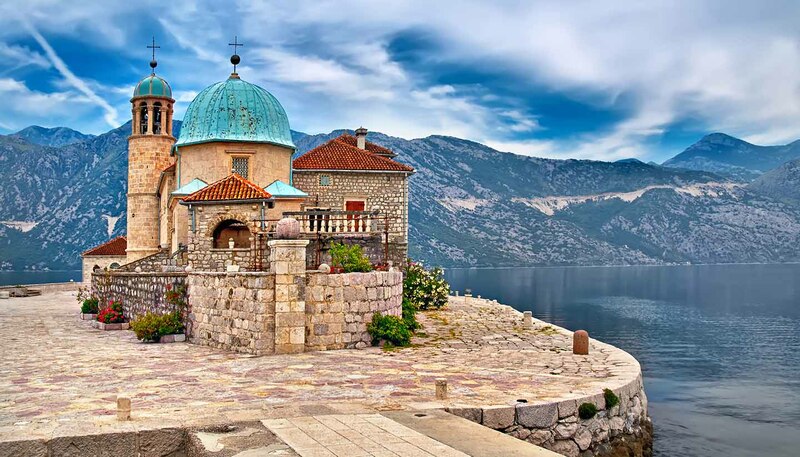 To the east lie the deep blue waters of the Adriatic Sea, and it is the 293km (183-mile) Montenegrin coastal strip that attracts the majority of visitors, with top destinations being the centuries-old seaside towns of Kotor and Budva. Here one of the most notably features is the stunning Bay of Kotor, a submerged river canyon resembling a fjord. Inland, the landscape is dominated by dramatic soaring alpine mountains rising over 2,000m (6,562ft), with the highest peak, Bobotov Kuk, reaching 2,523m (8,278ft). Here you’ll find dramatic glacial features, such as lakes and canyons, the most impressive being the River Tara Canyon, and dense forests. In the centre of the country, around Podgorica and Nikšić, lie fertile plains planted with crops and vineyards, while to the south, on the border with Albania, lies Lake Skadar, a vast wetland. Approximately 38% of land is given over to agriculture, but of this only 10% is cultivated, due to difficult terrain and poor soils.